Around the end of 2014 I became aware of flat pickups when I noticed a brand called Thinkbuckers. Looking further I found another brand called FlatPup, another by the Lace company, another brand by National. I was already building guitars by hand and was fascinated by the concept, but could find very little information on how they were built. 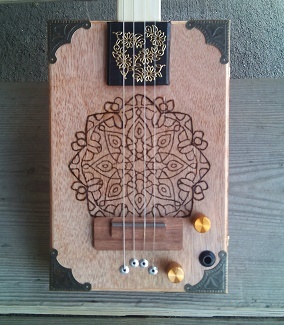 Even the cigar box guitar communities seemed very secretive (at the time) as to the process. Research revealed that flat pickups were nothing new; they'd been around for decades. Lace and National produce off-the-shelf models, but they are very pricey. There were no patents; the concept of a flat pickup could be made by anyone... if a person could figure out how it was done. Gaining little or no cooperation from the community in understanding flat pickup design, I went to the Net and did some research. Very little was found there. So I started experimenting by the seat of my pants, beginning with only a slight inkling of how these were made, based on non-specific photos. Existing pickups were wax potted and wrapped in cellophane packing tape-- a process that didn't appeal to me. I wanted something sturdier and more resistant to environmental changes. Factory-made flat pickups were pricey, starting at $145 each. I wanted to build a pickup that was especially sturdy and had a wide-range of sound ability, but at a price affordable to the everyday guitar player. Over a period of several months of extensive research and experimentation building pickups by hand, I started developing an unusual design, significantly different than prior designs I had seen. Not a quick process. Hundreds of hours were involved in basic R&D. Detailed records were kept on all attempts-- gleaning the best features. Eventually, the FlatCat pickup was born. * Considerable improvement over existing design concepts both in construction and resulting sound. Testers stated it sounded better and was more versatile than other pickups. * FlatCats are fully potted and encased in solid PolyResin, which makes them very sturdy and more immune to elements and the environment. * Because of their design I was able to create and offer the first low-cost 6-string flat pickup on the market, intended for use on standard electric guitars. Where factory-produced pickups started at $145 and up, FlatCats are priced at $50 to $55. FlatCats had extended beyond the realm of cigar box guitars. * Despite surprising gain in power, FlatCats remained wonderfully rich in tone. Now the pickup could range from mellow sound on the low end to a terrific natural-distortion grit on the high-end, making it the most versatile flat pickup ever made. 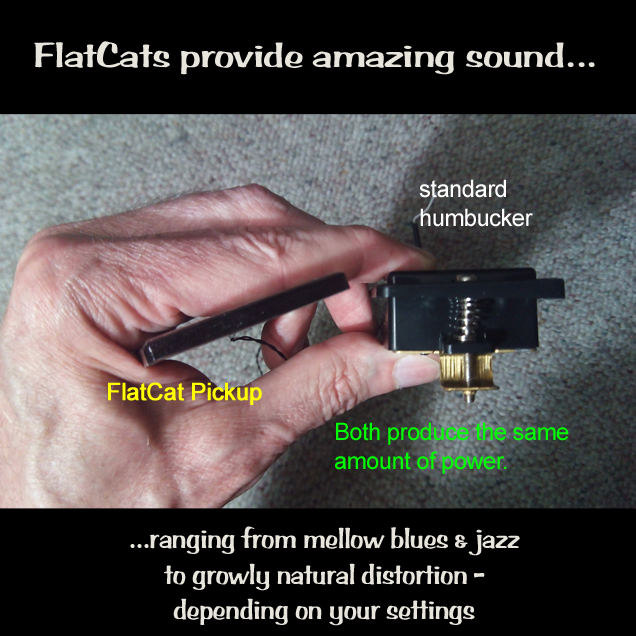 From mellow blues to jazz to country to rock-- a single FlatCat could cover them all. 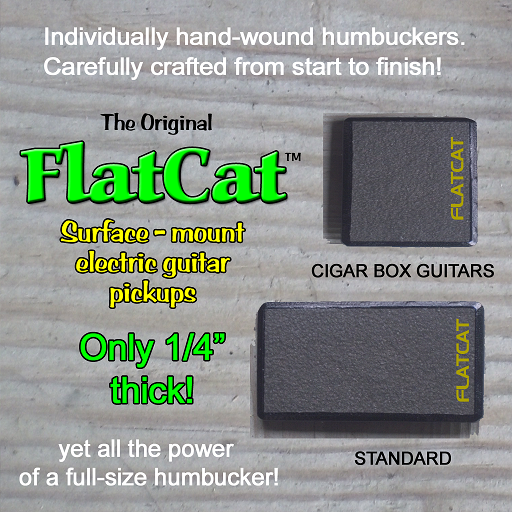 * FlatCat was released in Cigar Box Guitar and Humbucker footprints. Both models are aboout 1/4" thick and designed to be mounted to the surface of a guitar. FlatCats were released to the market and over the next several months earned solid 5-star reviews. They were purchased by professional luthiers, cigar box guitar builders and customers modding their own off-the-shelf guitars. Repeat purchases by existing customers proved their effectiveness. FlatCats are often specified as the "pickup of choice" by people who order custom guitars from Wishbringer, with those guitars receiving top reviews as well. Today the FlatCat is available in a variety of colors. Their sturdy composition assures their continued function over decades-- the wonderfully unique sound available to you for your special guitar projects. "I finally finished the guitar for which I bought your pickups and have had several players over to try it. Everyone agrees your pickups sound great. They live up to every claim you make and then some :D"
Customer appraisal: "Excellent pickup. Sounds awesome!!!" The FlatCat™ no-hum electric guitar pickup is about 1/4" thick... but provides all the power of a full-size pickup. It is surface-mounted on your guitar. 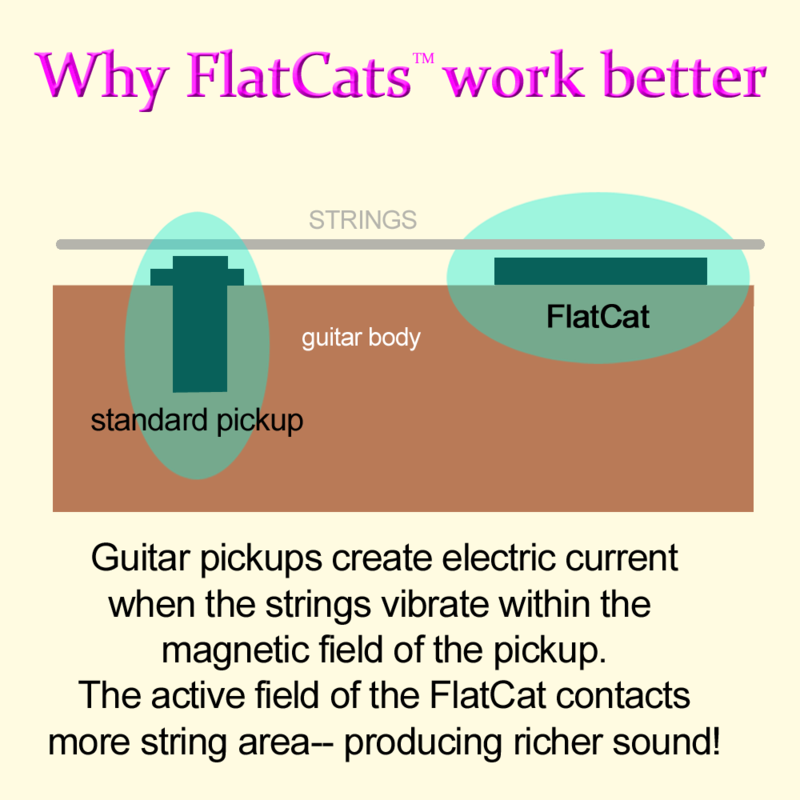 The entire pickup being directly beneath the strings allows the FlatCat to pick up every nuance of sound, transmitting accurate and rich signal to your amplifier. No other type of pickup can achieve that effect. Each FlatCat is individually hand-made with great care. The unique design eliminates the hum you get from single pickups. If you're acquainted with pickups, imagine a humbucker and P-90 combined and you'll have some idea of the wonderful tone of a FlatCat pickup. FlatCat works with standard electric guitars, cigar box guitars (CBGs), folk guitars and other instruments that use steel / nickel strings. It produces especially fine tone on all such instruments. A professional luthier stated: "This has such a balanced sound. It brings out a full bass end without losing the trebles, and has almost an acoustic sub-tone to it. It's a great pickup." The FlatCat is surface-mounted to your instrument. Rather than needing to route or carve a hollow for your pickup, all you need to do is drill a hole for the wire, or mount it directly over the existing pickup hollow. Easy how-to installation instructions are provided for a variety of mounting methods. 2. Humbucker-size: 3 1/4" x 1 3/4" (corner mount humbucker size). FlatCats have also been made to custom sizes at customer request. A reasonable molding charge is involved. The special design allows for a wide range of sound: blues, classical, smooth jazz, folk, country and rock. FlatCat™ pickups can be used on any electric guitar that has sufficient clearance between the surface and strings. Strat-type guitars will likely need a opening cut in the pick guard to seat the Flatcat with sufficient clearance for the strings. FlatCats are unusually rich-toned, easy-to-install pickups that work with almost any steel / nickel / chrome stringed guitars.